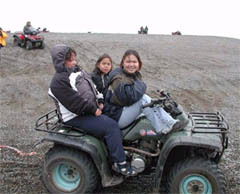 Eskimo childrens ride an all-terrain vehicle in Gambell, Alaska, which is on St. Lawrence Island. 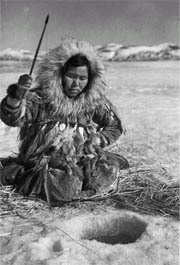 GAMBELL, Alaska — When it became clear that the elders in this isolated Eskimo village on St. Lawrence Island in the Bering Sea approved of the marriage, Clifford Apatiki's relatives did what was required of them: They bought him his bride. 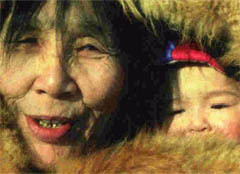 That meant, according to a fast-fading custom here among the Siberian Yupiks, a small but sturdy native Alaskan tribe that has inhabited this treeless and brutally windy island since about A.D. 500, that Mr. Apatiki's family would spend at least a year coming up with the payment. 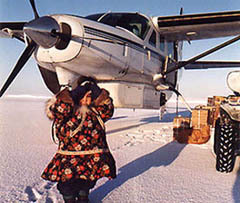 They called on their relatives, here in Gambell, over in Savoonga, the other Yupik village on this island 38 miles from the Chukchi peninsula in Russia, and across Alaska, to send them things — sealskins, rifles, bread, a toaster, a house full of gifts. 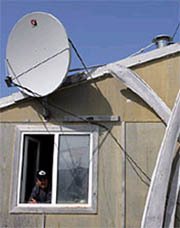 Almost every house has a satellite dish now, and the first cellular telephone tower was built, near the one-room trailer that serves as the police station, a few years ago. "I'm sure people will continue to do it for a while," Mrs. Apatiki said one evening in the living room of her one-story home in the village. "If the tradition isn't in effect with some families, they are whispered about. They will say about a girl, 'She was not bought.' "
"Gambell, it has changed quite a bit now," said Winfred James, 82, one of the village's most knowledgeable elders, one recent evening in his living room, where he was watching a CNN interview with Senator John Kerry and his wife. "Westernization is coming in." 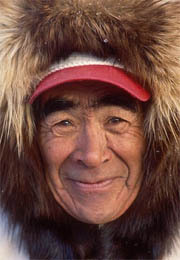 Mr. James said he and other elders were deeply concerned about losing the marriage customs, "but it probably will change with the next generation." "We try to teach them to do that, you know," he added. "So they can know each other, so they can stick together." "They work for maybe a month, and then I guess they forget," said Christopher Koonooka, 26, who teaches at the village school in a bilingual program. Mr. Koonooka said he saw many of his peers rejecting the old traditions. "Technology has had a big impact, in good ways and bad ways," said Mattox Metcalf, high school program art coordinator for the Alaska Native Heritage Center in Anchorage and a Siberian Yupik who was born in Gambell. "Some of my relatives have said they are competing hard with what's on T.V." "The younger people are seeing stuff on T.V., and they are slowly realizing that what they do is different from what other people do in the U.S.," said Mr. Metcalf, 24, who travels here frequently to visit relatives. "And they want to be like them. The older people are trying to fight for their minds and fight for their attention. It is kind of at a stalemate right now." "Everyone now has access to the way the rest of the world lives," Dr. Jolles said. "They are American citizens and they have the same interests and values." She added, "They are watching how other people live on television, the modern movies, and there is a great impact on young people." 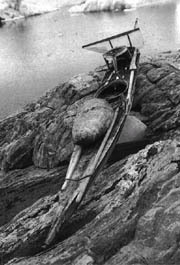 Split walrus skins, used to cover and waterproof the hunting boats, were stretched across wooden planks, drying out under the sun. Some of the women were picking greens up on the mountain, preparing to soak them in tall buckets of mountain spring water and store them for the winter. In the winter, the rocky mountain is bare, except for gravestones and above-ground coffins in the village cemetery and piles of snow. There are greens and berries to be harvested here in the summer and sea fruits wash up on the beach in the fall, but no fruits or vegetables can be found in the winter. 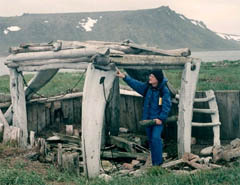 Other women were picking through the cache of meat carved from a 40-foot bowhead whale caught last April, contemplating dinner. The meat is kept in hand-made freezers dug out in the still frosty tundra, on a foggy landscape scattered with giant whalebones, prized trophies laid across the black gravel. Later that night, the women sliced up the whale blubber and served it on a large tray, along with bits of smoked seal and walrus flippers, a delicacy, at a party for a couple celebrating their 17th wedding anniversary. "I will be going to work soon," Mr. James said late one evening, as the sun, which does not set here in the summer until 2 a.m., was still lighting up the village. "It's what I will do," he said. This evidence that some young people are still keeping the marriage tradition makes many elders happy. Perhaps the Gambell resident most concerned about what the village is facing these days is Edmond Apassingok, 41, president of the Indian Reorganization Act Council, which, along with the Gambell City Council, governs the village. "Every generation is losing something," he said.